The uncooked salsa (i assume salsa is always raw?!) really lifted the roasted duck - its a salsa to always bear in mind whenever you cook duck, particularly as its so easy to make. 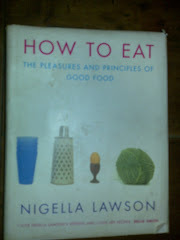 Nigella suggests duck breasts but i used a duck leg which worked just as well. - Slash the skin of 4-5 duck breasts, sprinkle with soy sauce and cook for 20 mins on a rack at 200C. - Meanwhile, peel 2 oranges (i used clementines) and slice into small chunks. - Finely chop 1/2 red onion and a fresh chilli, and add to the oranges, along with a good clump chopped coriander and 1/2 as much mint. - Sprinkle with salt and squeeze 1/2 lime over it. 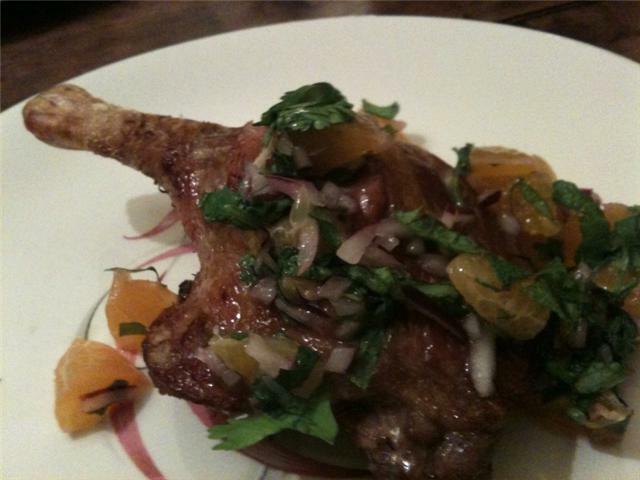 - Take the duck out of the oven and add the salsa. I cooked this back in camden, together with the panchphoran potatoes and the pomegranite aubergine for tara, and it all seemed to work together.